•Meet with you to get to know each other and learn about your goals and timelines and budget. 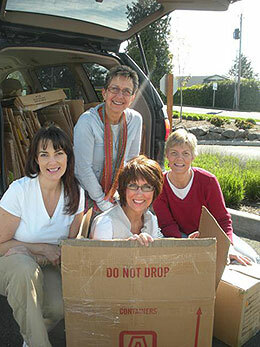 •Downsizing, sorting and helping with the selection of items to be moved. •Developing a floor plan for your new home. •help you with the question "what to do with the rest of the stuff?" •Expert packing and unpacking, providing all needed boxes and materials. •Supervise movers and coordinate placement of furniture. •Setting up your new home so you can settle in with clocks set, dishes in the cupboards, shower curtains hung, beds made and everything put away to your specifications. •Decorating for you and even hanging pictures. •Sale, donation, recycling, and disposal of unwanted items. •Estate sale service and home clean outs.